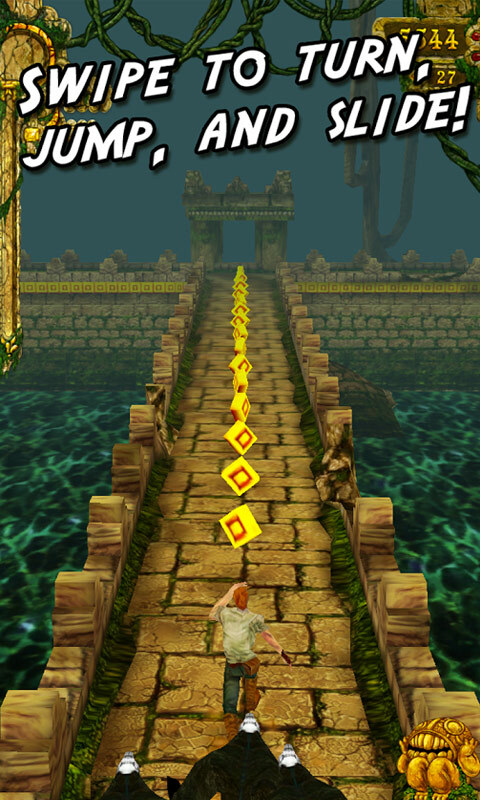 In Temple Run, you’re an adventurer where a thirst for discovery and journey runs through your blood. You arrived at an ancient temple, and out of curiosity, you stole the cursed golden idol. Now, you’re in doom because the Evil Demon Monkeys are chasing you and on your tail. They want the golden idol back to its rightful place! You have to run for your life or you’ll be crushed to death. Unleash the Indiana Jones in you as you run away from the temple while sliding, jumping and turning to avoid the obstacles. 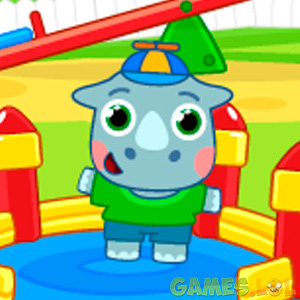 Navigate through a maze of dangerous traps, narrow bridges, cliffs and many more. Earn more coins, unlock characters and gain power-ups as you learn various tips when you download the online Temple Run game! Download Temple Run now and let’s see if you can survive this challenging adventure. 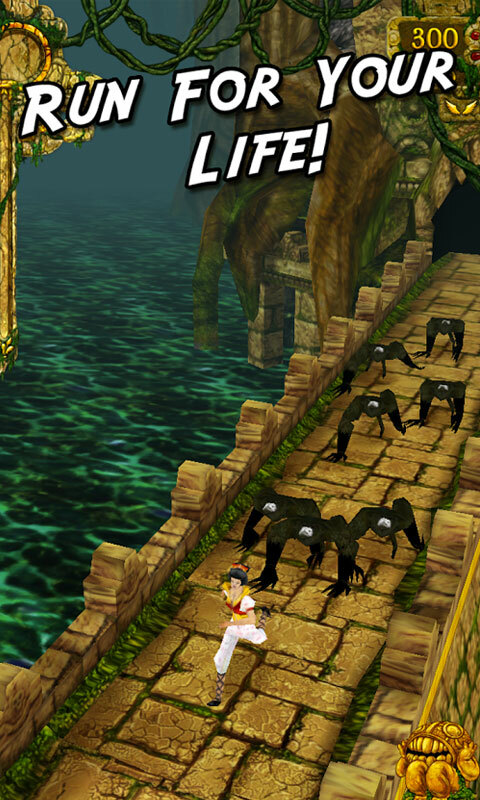 Do you have the quick reflexes and agility to survive this endless runner to escape the Monkeys that protect the Temple? Play the game now to find out! 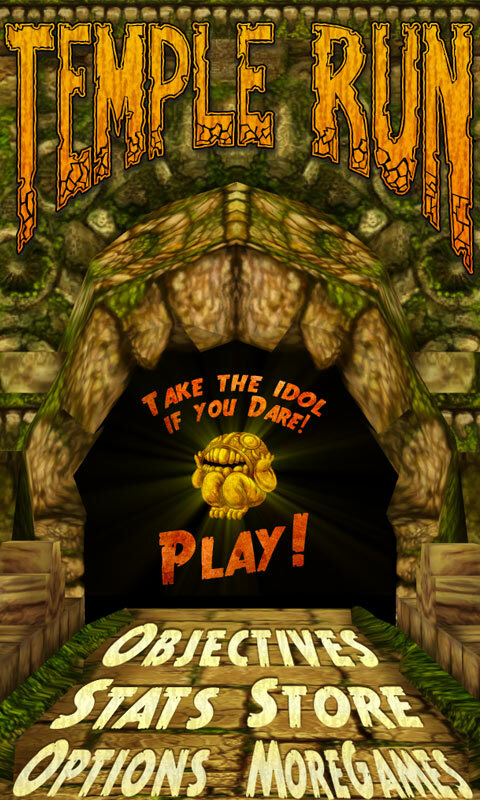 Temple Run is one of those arcade games that have straightforward mechanics but takes the challenge up a notch because of the many obstacles and traps. In fact, there is no single way to technically “beat” the game. However, once you get caught in a trap or bang your head in a low-lying branch, you’d go back to the start and run again. Therefore, this will give you an endless opportunity to refine your technique, slowly beating your previous high score. 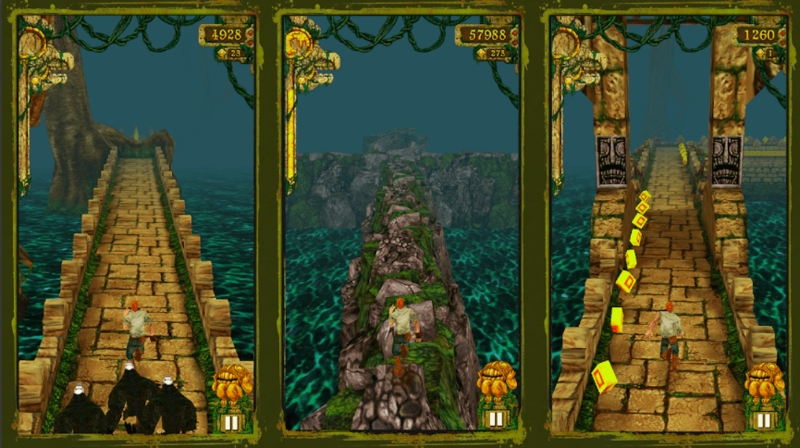 Temple Run’s control is different from its other versions. Playing in PC gives you the higher resolution and realistic experience. However, you can’t swipe to control the directions of your character. So, you can make use of the keyboard arrows to make your turns. Press the right arrow to turn your character into that direction, and left arrow to the opposite direction. Press the up arrow to swipe up and make your character jump, and down arrow to slide. 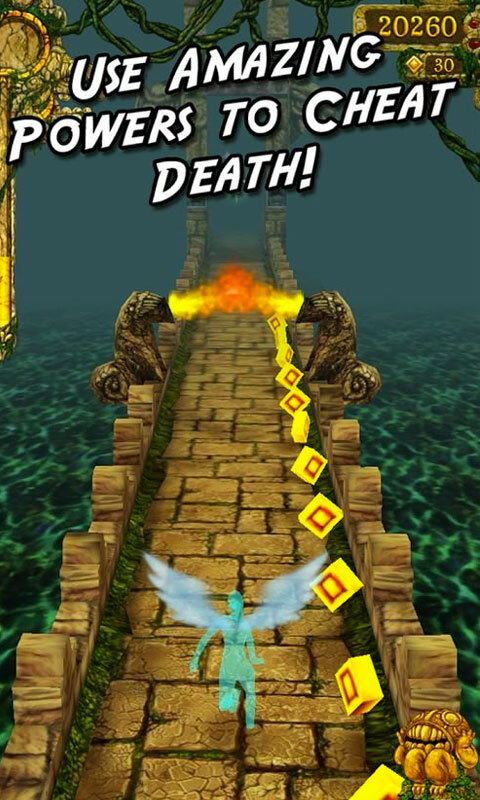 Playing a fast-paced endless runner game like Temple Run will need helpful power-ups, or else you’d easily meet your sticky end. You can collect the power-ups that randomly appear in different places. So, aside from your quick reflexes, you should also be alert and ready to spot these power-ups. These can also be upgraded up to five levels, and these change as they upgrade. The Mega Coin gives you extra coins, which increases too as you upgrade. The Coin Magnet automatically collects the coins nearby. The Invisibility power-up gives you immunity from the traps so you can run continuously without dying. The Boost will give you a speed boost up to a certain distance, making your character immune from traps and obstacles too. There are other items that you can collect in Temple Run so you got to be quick and alert! As the game starts, your default character will be Guy Dangerous. But, one of the best incentives in this game is that you can unlock other characters either through coins, gems or ranking. 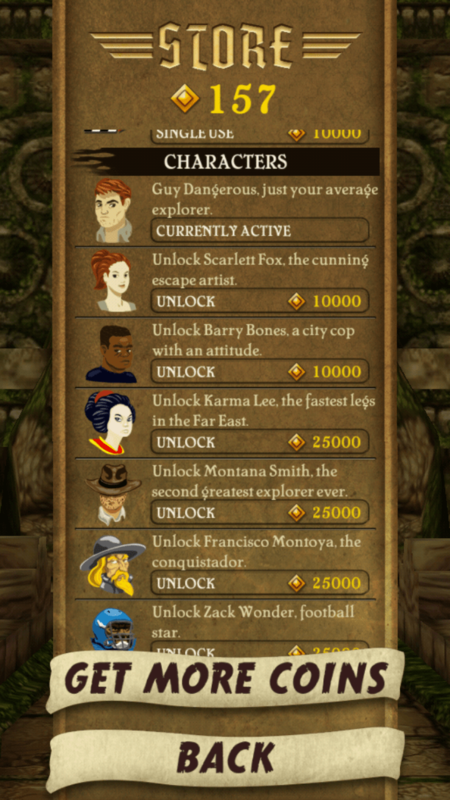 Activate Scarlet Foxx (a cunning escape artist) and Barry Bones (city cop) for 10,000 coins. If you want to experiment with other characters, you can activate Karma Lee (fastest legs in the Far East) and Montana Smith (second-greatest explorer) for 25,000 coins. Other unlockable characters are Francisco Montoya and Zack Wonder. As the game progresses, it becomes more difficult for you to survive and sprint around the ruins. Luckily, one-use items are available for you to purchase. One of these is the resurrection wings you can use once you meet your death. If you want to be resurrected and resume playing the game, click the wing icon beneath the coin count. 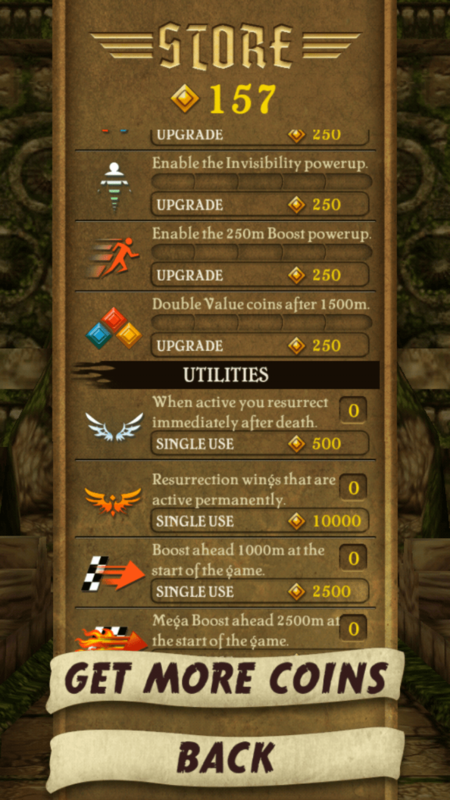 Other utilities like boost and mega boost can be activated using coins and will give you a boost of 1,000m (normal boost) or 2,500m forward (mega boost). If the action is becoming pretty fast-paced, you can purposefully slow down without risking yourself to die. Just run straight towards the low-hanging tree roots and trip over in purpose. This is the easiest tip that you need to remember in Temple Run. Although the path and obstacles ahead of you are random, you still have to plan your escape. Start with the goal. Do you want to upgrade the boosts and perks you have or collect as many coins as you can? However, don’t do both especially if you’re still a beginner, or else you’ll see yourself getting crushed to death or falling off the cliff. 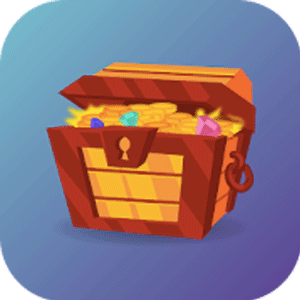 You can maximize your efficiency by determining your goal in the game, may it be to beat your high score, upgrade the boosts or collect lots of coins. So what are you waiting for? Embark on a different kind of adventure! 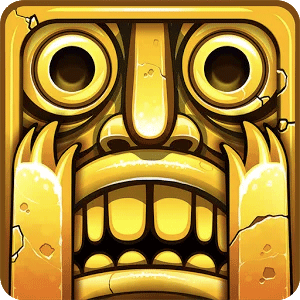 Download and play the Temple Run online game today for free! If you enjoyed this game, be sure to check out our other arcade games such as Miraculous Ladybug & Cat Noir – The Official Game and Donuts Drift now!